On February 24th, the severe weather season came in with a bang when a severe thunderstorm hit the city of some 16,000,000 people. Clearly from the video and from the fatalities there was some significant straight line wind damage though standards of construction require less winds to be severe than should be expected in a developed country. What we do know is that it appears to have taken place in the middle of the day with a 75F temp and 66F dewpoint with a 5kt SE wind blowing into Dhaka. Authorities said a hailstorm that followed dark clouds and thunder caught Dhaka residents off guard. Several districts in the southwest, including Barisal and Chittagong, also experienced a storm on Wednesday. In Narsinghdi, two sisters were killed when a wall collapsed on them during the storm. In Naraynganj, six people were killed when a trawler sank in the Dhaleshwari River. Two people were also killed in separate incidents of lightning strike in Moulvibazar. A large section of the Supreme Court’s fence collapsed when trees fell on it. At Sirajdikhan in Munshiganj, 25 grade 10 students of the Kajishal Hajigaon Humayun Molla High School sustained injuries when the tin roof collapsed during class. Meanwhile, 13 community health center workers, who were protesting to demand the nationalization of their jobs, were hurt when they were hit by hail at the Central Shaheed Minar. 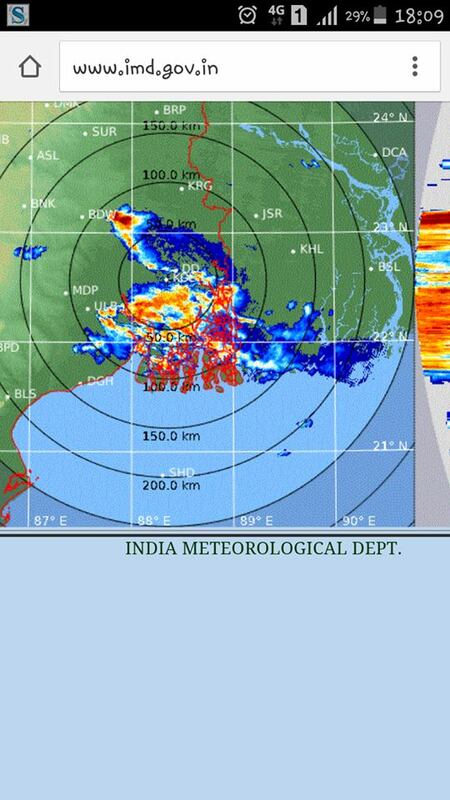 Rains in Dhaka and surrounding areas had been forecast by the Met Office because of an easterly low in the region. In Thursday’s forecast, it said rain or thunder shower along with gusty or squally wind is expected to occur in Barisal, Chittagong, Khulna, Dhaka and Sylhet divisions. The Met Office added that the weather may remain mostly dry with partly cloudy sky elsewhere in the country.